How much does it cost to travel to Urbino? How much money will you need in Urbino? €94 ($106) is the average daily price for traveling in Urbino. The average price of food for one day is €31 ($35). The average price of a hotel for a couple is €85 ($96). Additional pricing is in the table below. These average travel prices have been collected from other travelers to help you plan your own travel budget. Located in central Italy, Urbino is a remote and less-traveled walled town, tucked away in the hills of Le Marche. Under the ambitious and honorable rule of Duke Federico da Montefeltro in 1444 to 1482, Urbino thrived in culture because the Duke so deeply appreciated art and literature. Known as one of the original sites of Renaissance culture in the 15th century, Urbino experienced a large influx of scholars and artists. Today, Urbino is still known as the pinnacle of Renaissance art and architecture. Urbino enjoys mild weather, with highs in the mid 40s and lows in the upper 30s in wintertime and highs in the mid 80s and lows in the upper 60s in summer. Rainfall is abundant in this region, even in the driest month, which is July, while November experiences the heaviest rainfall. 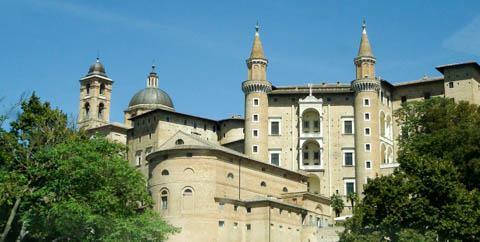 The entire city of Urbino was named a UNESCO World Heritage site in 1998. Within the historic center of Urbino, you will find a number of places to explore, all within walking distance of one another. Urbino is the birthplace of some of the most important Italian Renaissance painters, Raphael and Federico Barocci. Get a glimpse of Raphael's family life in his very own home, Casa de Natale Rafaello, north of the Piazza della Repubblica. The Ducal Palazzo is the biggest tourist attraction in the city and for good reason  the architecture in the high ceilings and wood-paneling are simply grand. Located within the palace is the Galleria Nazionale delle Marche, where you can find numerous famous paintings that are especially well-preserved. Don't forget to stop into the Duke's study to see Piero della Francesca's famous painting, "The Flagellation" of Christ. Renaissance art lovers won't want to miss the Oratorio di San Giovanni Battista. Though it is small, it's the perfect quiet and unhurried place to take a look at beautiful frescoes of scenes from the life of Saint John the Baptist painted in the 14th century by Lorenzo and Jacopo Salimbeni. Be sure to drop into the Cathedral, especially to view the intricately decorated side chapels and Barocci's painting of The Last Supper. For a breathtaking panoramic view of the entire city and its surrounding rolling hills and fruit orchards, make the steep ascent up to beautiful green space of the Parco della Resistenza in the midst of the medieval town. Local specialties include Crescia Urbino, a golden crisp flatbread, usually eaten with sausages, ham, cheese or herbs. Try a hearty crescia along with a hot and crisp slice of pizza at Pizzaeria Il Buco, right in the center of town. Casciotta d'Urbino is another local item to try in your crescia. This is a soft and mild cheese made of both sheep's and cow's milk, believed to be a favorite of Michelangelo. Tartufi Antiche Bonta is famous for its truffles, but also serves a delectable tasting menu of regional meats and cheeses at moderate prices. Students love Peccati di Gola for its low prices but even more for its fresh pastries, especially cornetti, or croissants filled with chocolate, Nutella, and vanilla crème. For more regional specialties, drop into La Taverna degli Artisti, where ambiance isn't sacrificed for authentic Urbino pizzas, pastas and sweets. Just because it's a small town doesn't mean it's always quiet. Thursday is a big night for nightlife, especially with university students, who may often be seen drinking in the piazza before heading out to the bars until 3 or 4 in the morning. Piazza culture is life here, so don't be surprised to see people lingering through the night. The closest airports to Urbino are Ancona, Bologna, Rimini and Forli, all domestic and will require additional paid transportation to arrive into the city. Pesaro is the nearest train station to Urbino at about 40 miles away. Expect to take a bus from the train station, which will take between 45 and 75 minutes, depending on the bus and time of day you leave. You can buy your tickets at a Tabbachi store, a newsstand, or directly inside the bus from the ticket machines, but be sure to bring exact change as the machines do not provide change. Buses also run daily between Rome and Urbino, and take approximately 4.5 to 5.5 hours. While hiring a car isn't the most economical choice when it comes to budgeting, it certainly allows you much more freedom and flexibility. You can also use blablacar.com for ride sharing if you don't want to responsibility of driving yourself. Urbino is small enough that, within the city, you can easily walk everywhere. Be sure to wear comfortable shoes to walk on the cobblestone streets and up and down the steep hills.